Sunset Yoga at Kanawha | Kanawha Plaza | Happenings | Style Weekly - Richmond, VA local news, arts, and events. 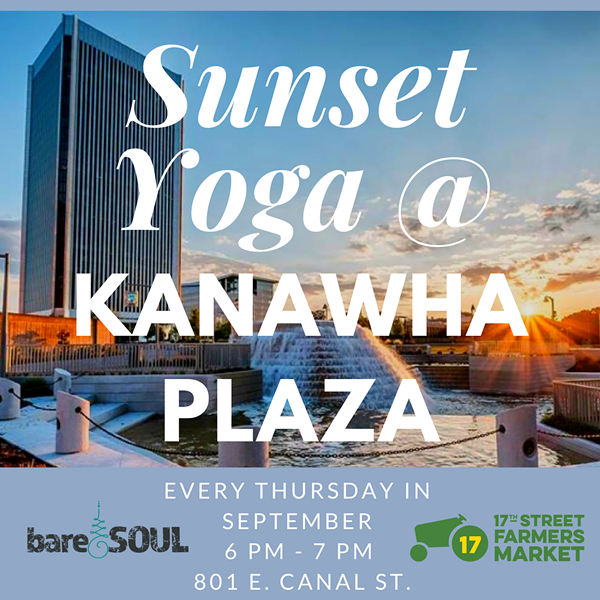 Join the 17th Street Market and BareSOUL Yoga every Thursday in September for Sunset Yoga at Kanawha Plaza! Grab your mat, colleagues, friends, and family and join us for a community class to release and unwind in the middle of our beautiful city! Classes are open to ALL with a suggested donation of $5 to BareSOUL Yoga. Classes will be taught by a BareSOUL yoga teacher. Please bring a yoga mat, comfortable clothes, and a water bottle.